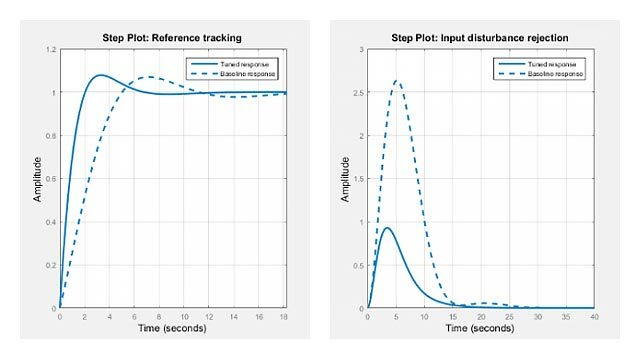 lqi computes an optimal state-feedback control law for the tracking loop shown in the following figure. where xi is the integrator output. This control law ensures that the output y tracks the reference command r. For MIMO systems, the number of integrators equals the dimension of the output y.
where Ts is the sample time of SYS. When you omit the matrix N, N is set to 0. lqi also returns the solution S of the associated algebraic Riccati equation and the closed-loop eigenvalues e.
The pair (Aa,Ba) is stabilizable. (Q−NR−1NT,Aa−BaR−1NT) has no unobservable mode on the imaginary axis (or unit circle in discrete time). P. C. Young and J. C. Willems, “An approach to the linear multivariable servomechanism problem”, International Journal of Control, Volume 15, Issue 5, May 1972 , pages 961–979.